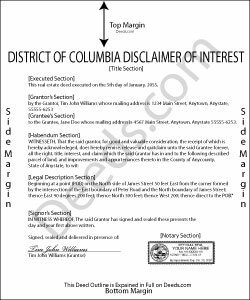 Under the District of Columbia Code, the beneficiary of an interest in property may disclaim the gift, either in part or in full (D.C. Code 19-1501 to 19-1518 Uniform Disclaimer of Property Interests Act). Note that the option to disclaim is only available to beneficiaries who have not acted in any way to indicate acceptance or ownership of the interest ( 19-1513). The document must be in writing and include a description of the interest, a declaration of intent to disclaim all or a defined portion of the interest, and be signed by the disclaimant ( 19-1505 (c)). Deliver the disclaimer within nine months of the transfer (e.g., the death of the creator of the interest) to the personal representative of the decedent's estate or the trustee, or file it with the court having authority to appoint such a person or enforce the trust ( 19-1512 (c), (d)). If real property is involved, avoid any ambiguity regarding the chain of title by recording a copy of the document in the office of the DC recorder of deeds. See D.C. Code for details ( 19-1512 (g) and 19-1515). A disclaimer is irrevocable and binding for the disclaiming party and his or her creditors, so be sure to consult an attorney when in doubt about the drawbacks and benefits. If the interest arises out of jointly-owned property, seek legal advice as well. Randy T. said: I gave your site and forms 5 stars because it is very easy to use and included all the information needed to complete the form without having had a legal background. Reply from Staff: Thank you Randy. Have a great day!